Muslims truly long for the Khilafah. Among the ruins of humiliation and destruction that afflicts the Muslim world, today Muslims are waiting for the earthquake, the day when Muslims in Turkey, the Arab countries and the rest of the Islamic countries take the initiative they have lost, and let go of any loyalty except to their Lord, and from any system except the system of their Deen, the great Islam. Islam transferred the Arabs from a marginal and worthless nation among the nations to the top of leadership after settling their internal situation with the rules of Islam, and building its strength in a very short period, which is still the subject of the study by political thinkers who began to invade and spread the great Islam. And the Arab tribes in the island accepted the new Deen, strengthening Islam before the end of the first decade of the State of Muhammad peace be upon him, and then it began to invade major countries around it. And the big question that Muslims answer easily is: if we repeat this today once more, and we establish the second Khilafah state, can it be as the first Islamic state? Muslims will certainly answer “Yes”, and the intellectuals of the Kafir states also know this very well, and politicians in major countries fear the return of Islam. They fear that the return of Islam will come from a strong state today like Turkey, whose people dream of re-establishing the glory of Islam, rooted in Ottoman history, when Istanbul was the center of the Islamic state and the whole Ummah, or its return from a strong country like Pakistan, or Egypt, that owns a large army and is linked to the Mediterranean and the Red Sea, and has the Suez (Canal) which is a World Trade Corridor. These concerns give the politicians of major countries sleepless nights, especially America. To recognize the American and European fears from the Khilafah’s (Caliphate) earthquake, the West sees a state of resistance in the Muslim Ummah. This is because the West used to control every major and small issue in the Islamic region. It controlled everything. However, at the beginning of this century, a new situation of resistance developed in the Islamic Ummah. The first major observation of this situation was in 2001 when the Taliban – Afghanistan refused to abandon Al-Qaeda, that America accused of the September 11 incidents and Taliban preferred to fight, and it lost power due to the US occupation of Afghanistan, but it refused to comply. That was the beginning, then came the US occupation of Iraq in 2003. After America declared victory over the Iraqi army, it found itself confronted by a fierce resistance that did not fear the US army. This resistance forced America into Iraq’s quagmires and it almost defeated it. Then, in 2011 there were the uprisings of the Arab Spring calling for the overthrow of the regimes; that is, the puppet regimes of America and Europe, which their popular legitimacy decayed and was eroded to the point where they were on the brink of collapse. These uprisings were not expected by the American and European intelligence services. This sounded the bells of the great danger of the state of resistance that began to explode. The Syrian revolution, which had been taking place since 2011, had a special position. The call to overthrow the regime was accompanied by another call for the establishment of the Khilafah Rashida (Caliphate), and it was a very serious call. Therefore, America dealt with it with much force by supporting the regime with Iranians and Russians and others in an attempt to suppress the revolution. America showed that it was opposing the Syrian regime and its Russian and Iranian allies, and this American policy is necessary to contain the danger, otherwise things would have worsened and exploded and became out of its hands and hands of its followers. Overall, the Syrian revolution has made America tremble because it was at the doorstep of the Khilafah’s (Caliphate) earthquake on the method of Prophethood. “For years, experts speculated that factors, some of them due to history, some of which are linked to recent important decisions, could further fuel the fire in the volatile region.” Thinkers in the “Atlantic Council” warned that chaos in the Arab region would lead to the idea that ​​ “its basis is the establishment of the Khilafah state on a large area”. American experts warned in 2016 from the outbreak of two major wars against America, one in the Islamic region, and the other in China. Meaning that America, to maintain its influence and its international standing, should look very seriously at the possibility that it may not have expected, that is, the caliphate state earthquake will explode on its face; therefore, it began to prepare. To make it clear, one must take a look at the reality of the ruling in Turkey and Erdogan’s subordination, and the fact that the so-called “moderate Islamic” groups are attracted to Istanbul and Ankara, and go back to see the seriousness of America’s view of “Ottoman Turkey”, and then look at the Ottoman indicators, which Erdogan displays, and make judgment from all of this on the seriousness of this dangerous idea, so that Muslims do not fall in this big political trap. As for the reality of the rule in Turkey, it is distinctly secular. The secular system built by Mustafa Kamal on the ruins of the Ottoman Khilafah is still the ruler in Turkey today. 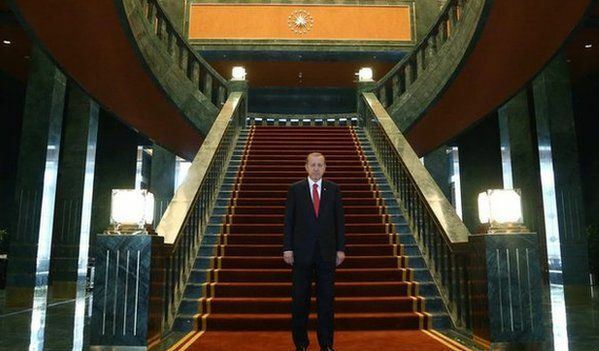 The form of the state, whether presidential as Erdogan wanted and conducted a referendum for it in 2017, or a parliament in which the state is lead by the prime minister, both are derivatives of the capitalist system that have nothing to do with our great Deen, and has no connection to Islam; it is a non-Islamic system in terms of the form of governance. As for the policy adopted on its internal side, it is a non-Islamic capitalist policy. Today, Turkey’s laws are laws enacted by the parliament, and none of its laws are from the Islamic law excluding some personal status laws which are a few. Even the issue of marrying more than one woman is permitted by Islam, but it is prohibited and not allowed according to Turkish law and even allows the Muslim woman to marry a kafir man. The laws of the judiciary are man-made and are not based on Shariah. Despite Erdogan’s Justice and Development Party (AKP), the ruling party, being described as an Islamic party, it is only an image that has changed nothing of the man-made laws and is not trying to change them. Some groups, which are described as Islamic, have put forward the idea of ​​”gradualism” in the application of the shar’i rulings, and the simplest understanding of the meaning of “gradualism”, regardless of the Shariah ruling on it, is the state based on the application of Islam “gradually”, so it applies a part and postpones another part, and every year it adds from the Shariah new rules. This is the simplest understanding. However, Turkish President Erdogan and his “Islamic” party do not implement any Shariah ruling (except for what we have said from a few personal status laws that were originally there before Erdogan) despite his rule of Turkey since 2002. «دَعُوهَا فَإِنَّهَا مُنْتِنَةٌ» “Leave it (nationalism) it is rotten.” Islam rejects and prohibits any nationalism that separates the one Islamic Ummah. Turkey’s foreign policy is not based on Islam. There have not been any activities by the Turkish state to call for Islam abroad. Anyone likes to build a mosque in America or to open an Islamic center in the West and all the regimes in the Islamic world do this, like the Gulf States, Egypt and others, and it is not special for Turkey. The Muslim communities abroad build mosques with the support of or without the countries of the Islamic world. Turkey does not advocate the issues of Muslims in its foreign policy as Muslims; it maintains diplomatic relations with the Jewish entity, and cooperates with it militarily despite the daily crimes against the people of Palestine, which Erdogan boasts about their support, but the Turkish support for the people of Palestine did not reach tenth of the support of any European country. This support is originally part of the West’s strategy of peace with the Jewish entity. In Syria, Bashar has killed hundreds of thousands. The distant America, its European allies and Russia have intervened in Syria. However Turkey’s intervention, which took place after years of killing, was in favour of the criminal Bashar. Turkey is pressing on the factions that follow it to negotiate with Bashar in Ankara, Astana and Geneva, and it brings them out of the battlefields with Bashar to other fields such as fighting in operation “Shield of the Euphrates” fighting the Kurdish organizations in the “Olive Branch”, and all the interventions of Turkey lead to the victory of Bashar over what is remained of the loyal revolutionaries. During the Rohingya crisis, which made the world cry, Turkey has delegated the brutal army of Myanmar with the aid it has announced that it delivered to the Rohingya. Even the voices of some European countries seem to be louder than the Turkish voice in supporting the Rohingyas. Thus, it is clear that Turkey is a secular state in its governance and its internal and external policy, and there is no Islamic Shar’i direction to observe that will give rise to the idea of “gradualism” despite all the Shariah reservations on this idea. And if things are clear in this way, those who are fooled by the Turkish-Erdogan’s Islam are deceiving themselves. Turkey is not like the rest of the countries in the Muslim world. It pursues the Islamic Dawah carriers and imprisons them. The state cannot stand the call to implement Islam in Turkey and it describes its advocates as extremists and terrorists, just as the West does. Erdogan’s subordination in his foreign policy does not need deep thought. Turkey, before Erdogan and with him, is a NATO state, i.e. it is officially under US military command, and it hosts one of NATO’s biggest bases, the Incirlik base. From this base, American aircrafts launch to kill Muslims in Syria and Iraq. This is on the one hand, and on the other hand, Turkey has been trying for decades to enter the European Union and it says that it is a European country, and it has been subject to the conditions of the European Union to join it. And despite the rejection of European countries because of its majority Muslim population, which is a fact, it did not abandon the request to join; therefore, the state in Turkey is a Western one in its aspirations and direction. President Erdogan has not changed that trend. As for strengthening his relations with the Islamic world, he is reacting to his refusal to enter the European Union on the one hand, and on the other hand, it has relations with man-made regimes within the existing man-made system, and it is not part of an attempt to change that. This is obvious, and does not need much evidence. Politicians who scrutinize the policies of countries find without difficulty the link between the Turkish state and America. America is the one that supported Erdogan and his party to control Turkey through many political means and financial facilities and so on. America wanted to restrain the generals of the Turkish army with European loyalty; this is materialized after the failed coup d’etat in 2016, in spite of a play to put the blame on “Gulen”, and the play of accusing America of some responsibility for that failed attempt. Perhaps the events of Syria were the clearest example of Turkey-Erdogan’s association with America. Turkish intelligence openly welcomed dissidents from the Syrian army officers alongside US intelligence in attempts to build up an armed opposition body such as the “General Staff” and the “Supreme Command of the Armed Forces” to divert the Syrian revolution and its military factions from the path of overthrowing the regime and building the state of Islam. Turkey and America were working together and openly, and this was the case with the Syrian opposition conferences that were overseen by America’s Ambassador to Syria, Ford, in Istanbul and Ankara. When America decided to withdraw from the negotiations with Russia on Syria after Trump’s arrival, it (America) made Turkey as its deputy in the Astana negotiations, which produced the American dream of a cease-fire in Syria and the reduction of escalation and the idea of ​​the guarantor states. Turkey is one of the countries that guaranteed the cease-fire, but the regime of Bashar and the Russians did not stop the fire, and Turkey did not guarantee anything. And just like America in the Security Council, it expresses its concern, while the criminal regime in Syria reclaimed Barada in the Western Ghouta and Chifonia and others in the eastern Ghouta, and before that the war in Idlib, all in the areas of reduction of the escalation that Turkey is their guarantor. Turkey’s policies are exactly those of America: “Let the regime win.” Thus, the loyalty of the Turkish President Erdogan is purely to America, and he fully coordinates with it Turkey’s foreign policy. Turkey’s activities to attract “moderate” Islamic groups are very prominent according to the Western policy of “divide and rule”. Turkey is a large “Sunni” state that can attract Sunni Muslim groups just as Iran can attract Shiite Muslim groups according to the same Western policy. The Turkish ruling party has been described as an “Islamic” party, easing the attraction process. Thus, Arab groups became active in Turkey, which are described as “moderate Islamic.” Istanbul has become a “qibla” for the Muslim Brotherhood, especially those fleeing the Sisi regime in Egypt after the 2013 coup against President Morsi; so we see conferences and grants and support of “moderate Islamic” parties, as if it is a new policy in Turkey adopted by Erdogan, contrary to his predecessors in power since Mustafa Kamal’s black era. Because of that support and facilitation, Erdogan’s popularity has been established among the Arab groups, which are described as “moderate Islamic”. He is called “the great Islamic leader” and the leader of the Tunisian An-Nahdha Party, Rached Ghannouchi praised him, and Qardawi even described as the “Sultan”. Turkey has become a haven for many Hamas leaders who have been stranded, especially after the siege of Saudi Arabia and Egypt to Qatar, after Qatar asked them to leave. In Palestine, America wants to make the Turkish influence on Hamas as a rival to the Qatari influence, so that it does not allow Qatar, and behind it Europe, to hinder America’s projects to solve the Palestinian issue. Turkey can only do this through enticing financial support and various facilities. In Syria, Turkey has succeeded through financial support, as well as its “reputation” of “Islamic moderation,” in dragging most of the Syrian military factions belonging to the “moderate Islamic” movement to cease-fire negotiations and dragging them to Astana to negotiate with the Russians and the regime. It fooled them that it is standing behind them as the “guarantor state,” and it dragged them into forbidden battles like fighting the Kurds rather than fighting and overthrowing the criminal regime. This is one of the secrets of the Syrian regime’s prolonged life that America provides through Turkey and others. After the coup of 2013 CE in Egypt, many Muslim Brotherhood leaders resorted to Turkey because the ruling party is “Islamic.” This is vital for the American policy that wants to control the movements of the Muslim Brotherhood after the coup against Morsi, and prevent any great danger to the Sisi regime. When their activities are out in the open, the other party can confront and thwart it. America also wants the State of Qatar not to be the sole influence on the movements of the Muslim Brotherhood. In the countries of the Maghrib, the movements of “moderate Islam”, such as the Tunisian An-Nahdha Party and the Moroccan Justice Movement and others, are very impressed by Erdogan’s Turkish achievements and want to learn this experience in governance and want to build strong relations with Turkey. This is a start to the influence of Turkey and America behind it together with other tools in the Maghrib countries and the attempt to introduce the American influence into it as an alternative to British and French influence. This is a dangerous game; when these «moderate Islamic» movements find themselves in a field of international and regional conflicts that has nothing to do with their Deen and its declared ideology, and they become as other secular movements, a fuel for the fires of conflicts that do not benefit the Ummah at all. In origin, changing of a secular system to another secular system is not a change in terms of Shariah, but it is very important in international conflicts, especially as America wants to overthrow the pro-British and French regimes by any means, whether by elections or by armed action. Turkey attracts “Islamic” opponents from many other countries, especially as it declares from time to time, as it was during the war in Mosul, as a center for «the Sunnis», within the framework of American projects of sectarian division of the region. America offers great facilities for Turkey to build military bases abroad, and this is to show Turkey as a big country. The issue began when Turkey sent troops in 2014 to train the Peshmerga in the camp Baasheqa in Iraq. Then, in the midst of the siege of Qatar, Turkey sent its soldiers to a new Turkish base in Qatar, and it is striking that the Turkish soldiers were landing in 2017 at the Al-Udeid base in Qatar, where the large US base is, and this is not possible without the consent of the Americans. America, seems that when it is planning to move two-thirds of its armies to the periphery of China, it is planning that a trusted country like Turkey to replace some of its bases or part of them like Al-Udeid in Qatar and also Turkey’s military base in Somalia. Small countries do not have military bases abroad. This is a manifestation of greatness, but to think that Turkey is a superpower is bad in political thinking. Turkey cannot solve the problems that are close and vital to it, such as America arming the Syrian Kurds, according to American interests. It cannot effectively intervene in neighboring Syria, as Iran, Russia and the countries of the international coalition with America. If it is unable to solve its vital and immediate problems, therefore it will find it harder to build its interests in Qatar, the Gulf States and Somalia. And it can only be understood by its military bases in those countries is that they are to serve American interests. During his visit to the Sudan on 24/12/2017, Turkish President Erdogan visited the Sudanese island of Swakin and a project was announced to revive the Ottoman heritage. The island was the center of the Ottoman navy protection of the Red Sea. There were reports of secret files to the Swakin Convention to turn it into a Turkish military base. During his meeting with him, Sudanese President, Bashir, said that he sees Erdogan as “the remnants of the Ottoman Empire.” In other words, Erdogan is circling the countries loyal to America like Sudan to promote Turkey’s new Ottoman image. This is a great facilitation that cannot happen without an American help. Those who think that the Arab rulers are independent in their decisions to receive Turkish or other military bases are fooled. Each follows the policy of his master, and Bashir follows the policy of America. Therefore, Bashir’s facilities for Erdogan only come within the US policy, which today is building up Turkey’s image. During his visit to Chad, Erdogan noted that “relations between the two countries date back to the sixteenth century when the Ottoman Empire was extending its influence over the region.” Chadian President, Idriss Deby, responded: “Turkey is a big country. There is a long history…it is a country known and famous worldwide. Turkey is an important country that has played an important role in the name of humanity and Islamic society throughout history”. (Turkish Anadolu Agency 26/12/2017). This illustrates the new Turkish orientation by highlighting “Ottoman Turkey”, which did not exist in the early years of Erdogan’s rule, but has finally emerged. There is a question remaining, which is related to the American seriousness in the idea and project of “Ottoman Turkey”. If we realize that America’s fears of the Khilafah (Caliphate) earthquake are real fears, and that is why it adopts policies that are implemented by officials. These fears did not emerge just from ideas in study centers and banks in America. America greatly benefited from the declaration of Baghdadi’s claimed Khilafah in Mosul; this benefit was in the form of destabilizing the situation in Syria which was calling for Khilafah. Baghdadi’s Khilafah emerged as a mixture of bloodshed, women’s enjoyment the “concubines” and the rules of tombs, graves and shrines, thus presenting a negative image of the great Khilafah (caliphate) state. This is on the one hand, and on the other hand, American and Western policies in general have failed to give the “moderate Islamic” movement the rule. The partial renaissance rule of Tunisia’s An-Nahdha party failed, and the partial rule failed in Yemen. The experience of Gaza is not great, and the Brotherhood’s experience in Egypt has failed. The most prominent American failure is that the arrival of these groups has not been able to stop what America calls “radical Islam” – which is the objective from allowing these “moderate” groups to gain power. Thus America dropped the idea of allowing “moderate” groups from taking power. On the other hand, the state of resistance in the Muslim Ummah is growing in a way that frightens America from surprises such as the events of the Arab Spring, and America is a superpower that is experimenting with various projects that it implements directly or through its followers, so that its international interests are safe. Therefore America’s search for a new project is definite to solve the resistance situation in the Muslim world, and not to leave developments to the surprises that may bring the great earthquake, the real Khilafah on the method of Prophethood. As America has benefited greatly from Baghdad’s declaration of the alleged Khilafah in Mosul, it is unacceptable to exclude the repetition of the idea of ​​a “fake caliphate” sponsored by America. However, there have been sufficient indications of the Turkish President Erdogan to link the Turkish state today with what was before the declaration of the destruction of the Ottoman Caliphate in 1923, as well as the facilities offered by America to Turkey in Sudan and other countries affiliated with it. This American project may be under preparation and that Turkish President Erdogan is introducing this to examine its feasibility. This is also indicated by Turkey’s clash with the European countries as if it wants to resemble the Ottoman state. Erdogan described Germany and the Netherlands as “the remnants of Nazism” as if he is unusually turning his back on them. In conclusion, it is not wise to ignore all indications of a very dangerous US project to turn Turkey into a “fake caliphate” state to stand against the real Khilafah. Its declaration will shake the entire world. Such a fake project of the Khilafah may confuse Muslims, especially the followers of the so-called “moderate” current whose leaders are building confidence in Erdogan, and some describe him as the Sultan, although he does not hide his relations with the Kuffar, including the Jewish entity. Such projects cannot be implemented in months, but they need a lot of work internally with the Kamalist parties and externally. But the most important thing that is required from the sincere Muslims, who have united their path upon the pure and pristine Islam according to the Shariah evidence , and those who want their work to be for Allah’s sake only, they must proceed seriously to build the great state of Islam, the second Khilafah Rashida on the method of Prophethood, whose loyalty is to the Lord and the rules are those from its strong Deen. It will shake America and the West, and immediately begin to remove their influence and military bases from the Islamic region, and sweep away their agents from the body of the Islamic Ummah, just as impurity is removed from the clothes. And it will implement the rules of the great Islam. And people will rejoice and the blessing will descend from heaven, and the situation of the Ummah today will improve, and will be like how it was yesterday. It will gather its energies and build its strength and terrorize its enemy, the enemy of Allah, this is not far-fetched, and for every order there is a decree. We ask Allah that this matter will be soon in the coming Days, and on that day believers will rejoice in the victory of Allah and the glory of the great Islam.